2. These are large dogs – who need a lot of space! 3. Their coat can vary – but it’s not high maintenance! The Pitbull Mastiff Mix can be a cross betweenany Pitbull or Mastiff. The term “pitbull” is actually used to denote several breeds of dog, which can include the Staffordshire Bull Terrier, Bully Kutta, American Bulldog, American Bully, and American Pit Bull terrier. 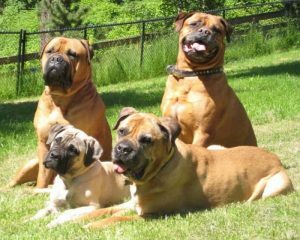 There are also many types of Mastiff breeds, including the English Mastiff, the Neapolitan Mastiff, and the American Mastiff, to name just a few. So, as you can see, a Pitbull Mastiff mix can potentially be a number of different crosses. That said, if you’re considering getting a Pitbull Mastiff Mix puppy and you would prefer a specific cross, you should do extensive research into your pup’s parentage. The most common crosses seem to be the American Pit Bull Terrier with the Neapolitan Mastiff, and the American Bulldog with the English Mastiff. 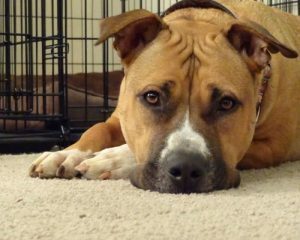 While any type of Pitbull or Mastiff dog can be used, there are a few characteristics that they tend to share, which is what I will outline in this article. Mastiffs and Pitbulls are large, very muscular dogs. So, it goes without saying that when you mix the two, you get a big, heavy-set dog. Pitbull Mastiffs usually weigh between 100-140 lbs (45 – 63 kg) and stand at around 25-29inches (63.5 – 74cm) tall. Given their size, I would not recommend getting this mixed breed if you live in a flat, as they will need ample room to move around. Ideally, you should have a house and a garden for her to run and play in. Furthermore, I do not advise getting a Pitbull Mastiff if you have a very small child. While these dogs can be good with children providing they are trained correctly, they could easily knock down little ones and injure them. This is particularly true if you get her as a puppy – an excitable Pitbull Mastiff and a small child don’t mix! A Pitbull Mastiff can fit in well with a family that has older children (10+), as long as they are always supervised when together. Since the Pitbull Mastiff can be a mix of many different types of dogs, their coat color can vary considerably. If you know her parents’ coloring, this will give you a better idea of what coat color or mix of colors she may have. The most common tend to be brindle, black, white, brown or red, and they can be a mix of few of these colors. As for the type of coat, it tends to be fine and short with low to moderate shedding. So, they will only need grooming once a week, and you are unlikely to need to keep the vacuum constantly to hand! This crossbreed is known for their intelligence, which means they are very trainable. They are, however, like most Pitbulls and Mastiffs, rather strong-willed. So, I do not recommend getting one of these dogs if you are a new dog owner or you prefer a “soft touch” approach. This dog will need a firm, confident leader who never backs down on a command and can remain assertive and consistent. By doing this, you will show her that there is a clear hierarchy and that you are at the top. Not having control with this breed could be potentially very dangerous, given that she is a very powerful dog, so it is not something to take lightly. The Bandogge is said to have originated from England in the 1500s, where they were bred for the main purpose of guarding. Indeed, still today these dogs tend to be aloof with strangers and very protective of their family. Her guard dog instinct is strong, so in the event of an intrusion or attack, she will not hesitate to defend you. Though it is said that they are very good at discerning suspicious behavior from normal. I am of the opinion that this should still be taught, as you’ll need to make sure that this guarding instinct is kept under control. You don’t want her aloofness to strangers to turn into aggression towards just anyone who tries to get close to her, your family, or your home. For this reason, it is so important that you socialize your Pitbull Mastiff Mix with people from a young age, both inside and outside the home. Invite friends, neighbors, and family to your house and make sure they give her treats and attention. Have them join you on a walk around the block – they can even take the leash to help them bond with her. If you do this consistently, you will show her that most people are safe and not to be feared. Just as with people, it is of the utmost importance that you socialize your Pitbull Mastiff with other dogs, too. While this goes for any breed, it is particularly important with some breeds, like this one, who are known to be dog reactive. To avoid unwanted aggression, surround your puppy with as many dogs as you can when she is young. Take her to the dog park, puppy classes, doggy day care – pull out all the stops. The more kinds of dogs she meets, the better – that means all ages, sizes, and breeds. These health issues are mostly hereditary but many can be helped or prevented through a healthy lifestyle. This means eating the right diet for a dog of her size. You should feed her a high-quality dog food made especially for large breeds, giving her the appropriate portions. A healthy lifestyle also entails (you’ve got it!) getting plenty of exercise. She should get at least an hour of vigorous exercise a day. Another way to ensure you are getting a healthy pup is by buying one through a reputable breeder. If the breeder is trustworthy, they should be able to provide you with the medical history of the puppy’s parents. A responsible breeder will also want to meet you face to face and to ensure the puppy is a good fit for you. They should be open to showing you the puppy’s parents and living quarters. Some good ways of finding a reputable breeder selling Pitbull Mastiff puppies are by asking for referrals from your vet or contacting local breed clubs. The Pitbull Mastiff is a fantastic dog for the right owner. If you have a spacious house, experience handling dogs, and you’d like a guard dog or a loyal companion for a family with older children, she could be the right fit for you. Just remember, she needs lots of socialization, with canines and humans alike, and you should use a firm, consistent training approach. If you want a particular cross or color, you should ask the breeder about your puppy’s parentage. Make sure your breeder is reputable – if they ask you questions, they’re happy to provide all the information you ask for, and can show health clearances for the puppy, you should be in good hands.